Aubergine and parmesan – a match made in heaven! – First of all, make sure that the butter and the water are ice-cold. I put my water and my butter in the freezer for 20 minutes before starting to work the pastry. – When working the pastry, work it qiuckly, and don’t mix it too much, as the dough will get warm from the warmth of your hand and it will lose its consistency. However, if your dough becomes too soft and sticky, just place it in the fridge for 10-15 minutes to cool off. Prepare the tart pastry: start with sifting the flour into a bowl, add the salt, the butter cut into peices and the water. Mix it with the tips of your fingers until it gets a crumbly consistency, then continue working the dough until it becomes firm. Shape the dough into a ball, wrap it in cling film and live it to rest in the fridge for about 30 minutes. Prepare the Bechamel sauce: melt the butter into a small saucepan on medium heat, sprinkle the flour and stir firmly for another 2 minutes, then gradually add the milk, lower the heat, stiring ocassionaly with a wooden spoon, add the salt, the bay leave and the nutmeg, and let it boil slowly until it thickens. Whent it has a creamy consistency, take it off the heat and leave it aside to rest. Blind-bake the pastry: Take the pastry out of the fridge, unwrap it and place it on a sheet of cling film. Cover with a new sheet of cling film and roll acrefully with a wooden rolling pin it until you get a thin sheet of pastry, sligtly bigger than the tart-dish. I find this clin film technique esier than just rolling the dough on a floured surface, but if you prefer this second method, just be careful to remove the excess flour when finised. Remove the cling film and carefully place the pastry on the buttered tart-form, pushing the dough against the edges, then lightly prick the pastry base with a fork. Line the pastry with baking paper and fill it with beans. Bake it for 15-20 minutes, then remove the beans and the baking paper and leave it to cool. Prepare the aubergine filling: Cut the aubergine into small cubes and fry them in hot oil until they become crispy. Drain them out onto a sift and then place them onto some paper towels to remove the exess oil. Mix the aubergines into the Bechamel sauce, add the egg-yolks, the grated parmesan and the parsley, mix everything togheter and add salt and pepper to taste. Place the aubergine mixture onto the tart, sprinkle some more grated parmesan and bake it at 180 degrees Celsius for another 20 minutes or until the tart gets golden-brown. 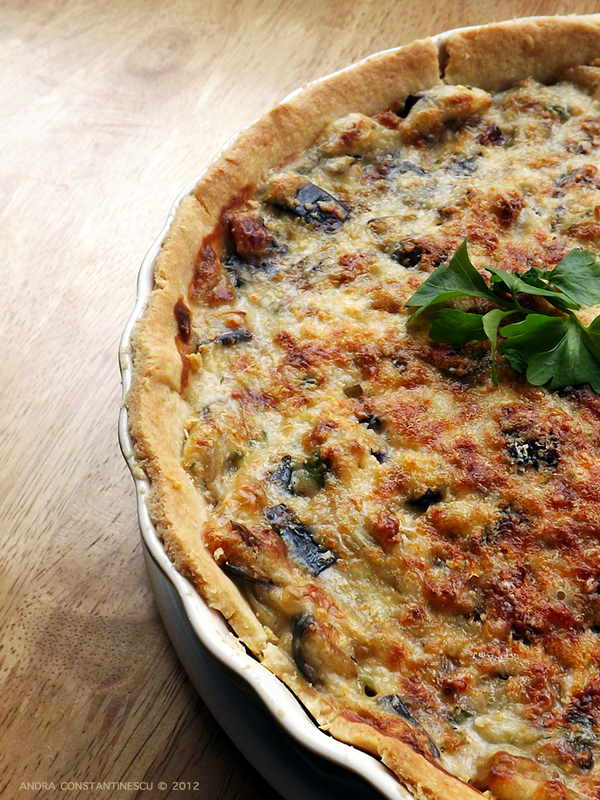 Serve the tart warm or cold, with some freshly chopped parsley and a good cold glass of white wine. it’s necessary to fill it with beans?